*This is the color of your choice. Purpose: This is an appearance only mod. It will dress up the engine bay a lot and make it easier on the eyes. Preface: Keep in mind that this is not something that most people accomplish in one day. We work on covering and/or replacing wire loom once a month or so. Before you start into this install be sure you know how to use all of your shop equipment. Take your time and be careful. 1. 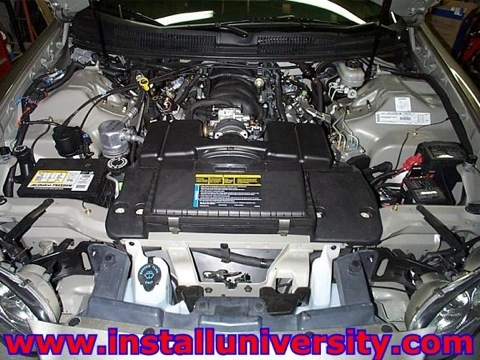 Open your hood to take a look at your boring engine compartment (see Figure 1 below). 2. 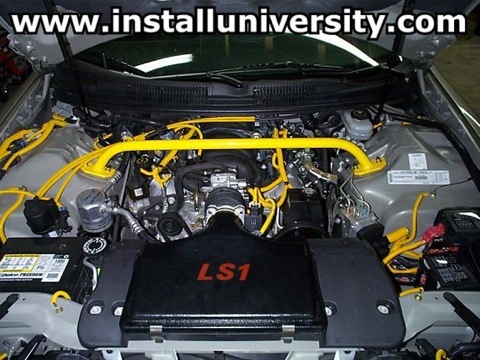 You must first choose a color you want to have in your engine compartment. This is a very important decision you will have to make. You want to pick a color that you will be happy with and will look good. Therefore, think long and hard on what color you want to use. We have a Light Pewter Metallic Z28 so the color choice seemed hard at first to make. That decision became very clear when we visited www.bmrfabrication.com. We were deciding on some suspension/structural mods to perform when we noticed you could order your parts powder coated in different colors. We instantly knew that yellow would be the color of choice once we saw the yellow suspension/structural parts. 3. We then located a a place to buy yellow wire loom. We visited all the sponsors of www.LS1.com and found that Internet Racer's Supply carries different sizes and colors of the wire loom (wire loom is also commonly called convoluted tubing). 4. Once we received our wire loom we quickly found out that we did not order enough of each size. The final amount we have purchased to date can be found in Chart 1 below. WE still need to purchase at least 10' more of each size of tubing. Also, we are looking for a larger size that we estimate would be around 1.25 inches in diameter. 5. You simply take off your existing wire loom and replace it with your colored wire loom. There is a slit down the middle of the tubing and it just slides over whatever you want it to. All you have to do is remove the black tubing that is on the car. The black tubing removes itself in the same manner as putting new tubing on. Takes about 10 seconds. Then you just cut it to fit with a pair of scissors. We also cover any lines in the engine compartment that look like they need some dressing up. Have fun and get a look at our engine compartment after a few mods and lots of colored wire loom in Figure 2 below. Comments: This modification gets a lot of looks when we pop the hood.